A former Minneapolis cop was sentenced Thursday, July 11, to more than three years in prison for punching a man at an Andover bar, causing the man severe brain damage. Note Officer is never hand cuffed, jailed or treated poorly similar when normal citizens strike someone. Bullies with guns and badges are quickly becoming the biggest threat to Americans. These same monsters often retire with huge monthly income payments. 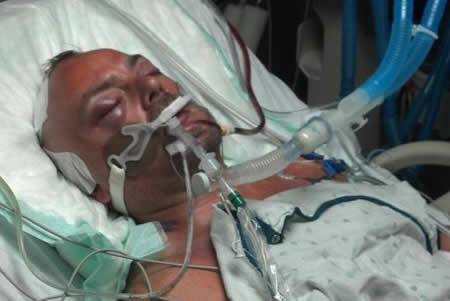 Victim Brian Vander Lee 43 after being punched in the face by SWAT Team Leader Officer David Clifford of the Minnesota Minneapolis Police Department who then ran away from the scene. Vander Lee has had two brain surgeries since the assault on his life. This is not who we need carrying a badge, gun or having any authority. Yet officer David Clifford was put in charge of a “SWAT” team which has access to military grade weapons bombs and even armored vehicles. insecurity issues and even people with social path or psychopath tendencies are being hired by the hundreds of thousands. 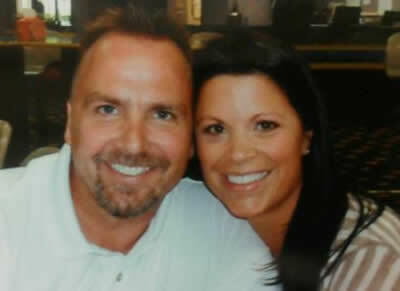 This is what Brian Vander Lee looked like before the attack and assault. He was not a criminal nor did he have a record. People have to think if the role was reversed and Brian struck David Clifford in the face how he would be treated? Would he be able to run from the scent of the crime, no APB issued, his home never searched, never thrown to the ground and arrested? There are clearly several classes in America and MURDER and CRIME can be committed and treated totally different when you’re hired as a police officer. It gives you the right to steal, lie, cheat, beat, rob and abuse people. Often with full pay and benefits. Lets not forget punishment is never as harsh and often they go free. America must consider that this man was the Team Leader for SWAT. “Special Weapons and Tactics” which has access to Military grade weapons. Is this the root to the problem of trigger happy police who kill innocent children? The problem is “Who are we hiring”? And why do we protect and allow other officers to protect criminals like this who are obviously problems. Alcohol was a factor in the altercation, said Anoka County prosecutor Blair Buccicone, though the 47-year-old police officer’s blood-alcohol concentration at the time of the incident is unknown because Clifford fled and didn’t turn himself in to authorities until the next day. Buccicone said Clifford admitted through his attorney to having at least one drink before the alleged assault. “Alcohol was a factor, let’s leave it at that,” Buccicone said. The longtime officer did not return a call for comment Tuesday, nor did his attorney. Clifford, of Andover, is accused of approaching 43-year-old Brian Vander Lee while the father of four was sitting at a table on the bar’s patio talking on his cellphone. Vander Lee works in advertising for the Minneapolis Star Tribune. Clifford reportedly leaned over to say something to Vander Lee and then punched him in the mouth with a closed fist as Vander Lee was attempting to stand up, sending the Ramsey man to the ground. Clifford told investigators he confronted Vander Lee about his use of offensive language as he talked loudly on his cellphone. Afraid Vander Lee was going to hit him, Clifford told authorities he opted to punch him first. Other witnesses did not corroborate Clifford’s account, according to Cmdr. Paul Sommer, spokesman for the Anoka county sheriff’s office. “The other patrons and the manager who was visible on video said they didn’t hear anything like that,” Sommer said. Vander Lee hit his head on the concrete patio and was taken by ambulance to Mercy Hospital, where he was placed on life support and underwent two brain surgeries. He remained in critical condition Tuesday but is now conscious and breathing on his own, according to his brother, Mike Vander Lee. The recent incident is the not first time the veteran officer has been accused of assault. Clifford is listed as a defendant along with the City of Minneapolis in a suit that accuses him of using excessive force while on patrol in 1995, according to Hennepin County court records. Harry Lazover, the plaintiff, alleged that Clifford hit him in the head and sprayed pepper spray in his face when the officer encountered the Hennepin County Medical Center employee on his way to work about 4 a.m. one spring day. Lazover was charged with fifth-degree assault but the charge was soon dropped. In 1999, the Minnesota Court of Appeals agreed the judge had erred and ordered a new trial. The parties then settled the case.